Seraquin was specially formulated by Boehringer Ingelheim to provide the best possible encouragement for the health of synovial joints. 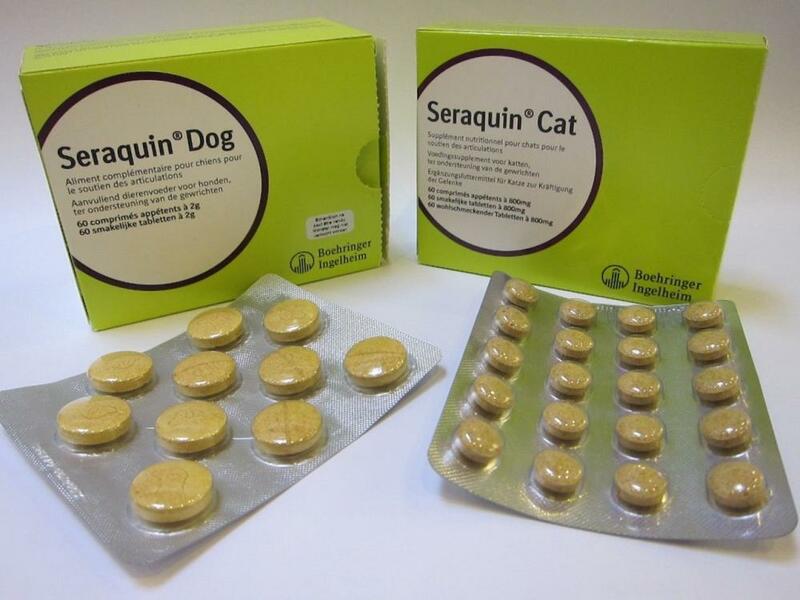 Seraquin tablets for cats and dogs are a combination of glucosamine hydrochloride, chondroitin sulphate and curcumin. Glucosamine and chondroitin are well known as natural supplements which are helpful for the promotion of normal function of cartilage and other components of joints. Curcumin is a powerful natural antioxidant which can help to reduce the damage caused by the free radicals. Overall, the combination of ingredients in Seraquin encourages optimal joint function. Seraquin is given once daily to cats and dogs and Seraquin for horses has a different formulation to best suit this species. 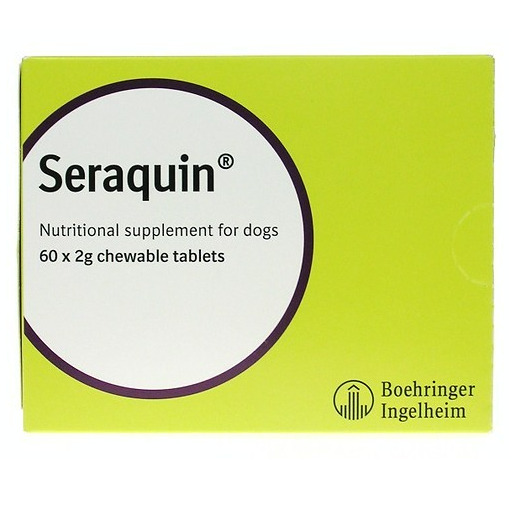 Seraquin is a palatable medicine in the form of a chewable tablet that can also be crumbled in food, so it is easy to administer to your dog or cat. It is naturally derived from high quality ingredients, meaning your pet will not suffer from any unwanted side effects and it can be given long term. Regular use can promote your pet’s joint health and is therefore particularly helpful for older pets. Inactivated yeast, glucosamine HCl, chondroitin sulphate, hydrolysed chicken protein, maize starch, saccharose, standardised turmeric extract, maize protein. Glucosamine HCl, inactivated yeast, saccharose, chondroitin sulphate, hydrolysed chicken protein, standardised turmeric extract, glucose, maize protein. Dicalcium phosphate (E 341), Excipient (E470). After the initial 4 - 6 weeks feeding period, the daily amount can normally be gradually reduced by half a tablet for the following week. This can be repeated on a weekly basis until a level of half the initial amount is reached. Seraquin can be fed directly to the dog as a treat or they can be crumbled and mixed with the normal feed. Below are some recent questions we've received regarding Seraquin Joint Supplement, including answers from our team. Can a pregnant cat eat this? Now I'm feeding my cat seraquin to prevent joint problem. I just want to know 'Can a pregnant cat eat this?' Will that be okay or not good for the baby? Thank you for your help. Seraquins safety hasn't been tested on pregnant or nursing cats however it is generally considered to be a safe supplement with no serious side effects. The degree to which your dog will improve following surgery cannot be guaranteed whatever you do. 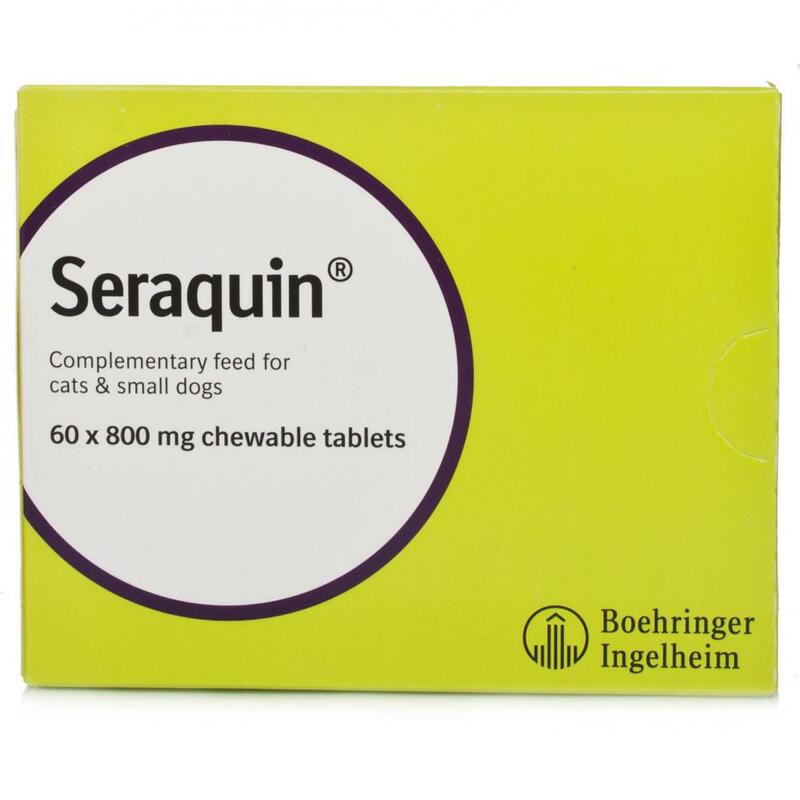 It will depend on many factors but Seraquin is widely believed to be able to help with this and improve the symptoms of discomfort and stiffness which may persist in future. I would say that it is indeed a logical choice to give to your dog along with the Metacam. You must make sure that you try and follow your vet's advice regarding a gradual return to exercise and maintain careful weight control as these factors are also important. How do you get your horse to eat this! my 16.2hh TB gelding has arthritis of the pastern joint,vet recommended this...but its proving impossible to get him to eat it.Ive tried garlic,mint and molasses.He sniffs it then knocks it everywhere.Its to expensive to waste!! !Any advise would be appreciated. It does have a distinctive taste and horses can be very determined not to eat something they have taken a dislike to. Almost all horses have some treat item which they adore and can be used to mask unwanted medication. It is trial and error to find which one suits yours. Things to try include peanut butter, cooked mashed carrots, bran mixed with beer, after dinner mints, or very sweet, sticky syrups containing molasses, brown sugar or whatever you think he might enjoy. This is not an easy job and you might well waste some, but unless you have a very cooperative horse there is no real way for most people to force it down. You just have to get him to eat it in a food he likes. Once you have found what this is, things can get easier. how much days do we have to eat all of these? It is intended that a these tablets are taken every day for a long period, possibly lifelong if needed. Terrier x sheltie stiff on right back leg. My 16 year old terrier x sheltie is stiff on his right back leg after sleeping, then after a 20 minute walk. Any of the glucosamine/chondroitin basaed supplements might be suitable. There is no good way of us testing one against another, but any of them might well prove beneficial. We have our own brand of joint supplement called Joint Force which is designed to contain all the potentially helpful constituents in a well balanced and palatable formulation. You might want to look at that. There are a few other things you can do to help your dog. One is to encourage regular but minimal exercise. The ideal thing for your dog would be to get up and potter about frequently during the day, every day, but never go for a longer walk or to do anything at all strenuous. If the joints can be kept moving about gently but not strained at all, that gives them the best chance of remaining supple and comfortable. The other thing would be to gradually lose a little weight if your dog is plump. This can only be achieved by restricting food and can seem too mean on an older dog, but carrying less weight around has a massive impact on mobility and joint comfort, so it might be worth bearing in mind. Hi, I currently am treating two small breed type dogs with a supplement that has green lipped mussel extract, Glucosamine HCI, MSM, EPA, DHA and Vitamin E in it. One dog has arthritis and the other hip dysplasia. I am trying to find something that may help them more than what I am already giving. Could you advise if you think Seraquin or Synoquin would help, and if so, should I dose separately with green lipped mussel? There are no significant comparative trials between all these different brands of joint supplement, so nobody can say which is going to be more effective. In our experience the product which has the largest number of positive reviews is Yumove, but that is not a scientific test. Our own product Joint Force was designed to include all the main, quality ingredients in the most economic form possible, so that should be as good as anything. Having said that I do believe that both Synoquin and Seraquin are top quality products and it might not matter too much which brand you use, as long as you include the various ingredients believed to be of benefit from a reliable source. This sounds like the sort of degenerative joint disease ("arthritis") which most older dogs get to some extent. It often seems to affect the back legs more than the front, but it is likely that many of her joints are getting stiff and sore. This is always more evident after periods of inactivity. The joints will loosen up with a bit of gentle movement. There are a number of things which can be done to help. The most effective treatment is prescribed anti-inflammatory medication. You would need to see your vet to get this, though we can supply it for you economically if your vet provides a written prescription. Seraquin and other similar supplements do seem to provide relief from these symptoms too, though not usually very quickly. They have to be used for a few weeks usually to see much difference. There are a number of other things you can do to help, regarding weight control and sensible exercise. Regular, gentle exercise twice a day is useful. It is important to keep the joints moving, but not under excessive strain. It helps to keep up with gentle, short walks, as well as just encouraging her to get up and move about a bit during the day. Weight control has a massive impact on mobility for dogs like this. Unless she is already slim, you would help her a great deal by getting her to lose a little weight. If in doubt, feed a bit less. Seraquin will probably help and is free from side effects, but prescribed medication and weight reduction usually make even more difference. Would a seraquin condroiton & glucosamine supplement help my 1yr old Brittany x Elk Hound who has luxating patellar in both hind legs. He is 25k and leads a very active life. Probably it will help, cannot be sure. Where there is any minor damage to the joint, these sorts of supplements seem to help to reduce the symptoms of stiffness and discomfort. A luxating patella will not be able to function as well as one in perfect position, so normal wear and tear on the joint is likely to be greatly accelerated. At some point, your dog may well show symptoms but the supplement should be able to delay/reduce these. I would recommend a supplement such as Seraquin. Stiffness in my dogs legs when she stands. My 3 year old St Bernard seems to be very stiff when she stands after laying for a while but after a few minutes of moving around it stops. Can you recommend anything to help this. She is 64kg. The symptoms you describe are typical for a dog with some degree of degenerative joint disease or arthritis. Your dog is not old, but as a breed they are very prone to trouble of this type. It is certainly worth a try with one of the joint supplements such as Seraquin or Yumove. There are lots of similar supplements out there and there aren't any good scientific comparisons of them to help decide which might be better. It does seem however that many dogs respond the these supplements and their mobility gradually improves over time. I would give it a try. In addition there are some other things you can do to help with the joints. First and foremost is to keep the dog's weight down. You should only feed the amount of food which is needed to prevent the dog from being skinny. Even a little plump can be bad for mobility on a dog of this size. If your dog has bad joints, treat it accordingly. Whatever might be the right amount of food for other St Bernards, it might not be right for your dog. If in doubt, feed less. The other thing is regular but gentle exercise. It is very good to keep the joints moving and exercised, but never anything too strenuous or prolonged, even if it seems fine at the time. These dogs are usually lazy, especially if the joints are tender, so encouraging regular, frequent, gentle but limited exercise is a good idea. Finally prescription medication is usually the most helpful for dogs like this. Talk to your vet about it, but a moderate dose of one of the NSAIDs might work wonders. We can sell them to you, but only if you send us a prescription from your vet. If long-term medication becomes necessary, this can make it much more affordable for you. No, this product does not require a prescription in order to purchase.